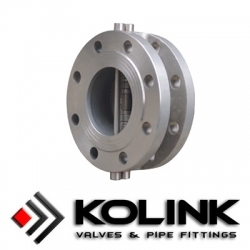 Dual-plate check valves are are bonnetless and mounted between pipe flanges (wafer style). In this case, the valve includes two spring loaded half-moon shaped discs that rotate about their shaft. The actual designs of these valves vary between design models and manufacturers. Most have multiple flat seats. The dual-plate check valve disc has short rotational disc travel and responds quickly to flow stoppage or reversal, thus the potential for moderate water hammer does exist. It is somewhat better than the swing check valve at minimizing potential water hammer, but with a much higher pressure drop. Depending on the design, maintenance effort ranges from relatively simple to difficult. All dual-plate check valves must be removed from the line to perform maintenance due to the bonnetless design. The dual-plate check valve also results in a higher pressure drop when compared to a tilting disc check valve of the same size. Although most of the wafer check valves are installed between two flanges, and no need to be flanged type, some other applications may need flanged type wafer check valve for better alignment of valves. The flanged valve body could be cast or forged upon customer's requirement.